Not only is kayaking incredibly fun – it is also one of the best ways to get exercise. The best part about taking a kayak out is that it will be an adventure almost every time. When it comes down to it, going to the gym can be incredibly boring, especially if you go to the gym every other day – the lighting is bad, it smells, the equipment is dirty and it is expensive. With kayaking, however, purchasing a boat is a one-time investment and a lifetime of positive returns. 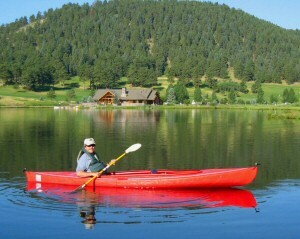 After that, it is all about finding a location where you can kayak in the open water. Here are five major health and fitness benefits of kayaking. It builds muscles. Kayaking is great because it can bulk up your arms and it can increase your upper body strength. If you go white river rafting, you are really building up your muscles, because you are forcing yourself through different challenges that include steep grades, switchbacks, boulders and other things that can get in the way. All in all, though, by kayaking regularly, you will notice stronger and more toned muscles. It reduces stress. Indeed, the stress relieving effects of kayaking are amazing because not only are you getting your necessary daily fitness – you are also getting out into nature. Combine these two things together and you have a powerful, stress reducing activity. Also, the physical exertion from kayaking can release different mood enhancing chemicals that can make you feel happier and more well balanced. So, if you are stressed out at work, school or with your family, you may want to think about purchasing a kayak from Malibu Kayaks – the premier maker of kayaks – and hitting the open water. It helps you lose weight. If you are suffering from obesity, kayaking can be a great way to cut calories. Obesity in and of itself can have a number of negative health effects, which can be incredibly devastating. These conditions include heart disease, stroke, and diabetes. Plus, kayaking can be a solo sport if you want it to be, which means that you don’t have to worry about the judgment of other people. Oftentimes, people are afraid of going to the gym, because they are afraid other people will judge them. With kayaking, this just isn’t the case. It will make you more social. If you decide to go kayaking with other people, the activity can be a great way to socialize. If you want to find a fun and healthy activity to do with the kids, kayaking can be a great way to bond and catch up with the family. And if you want to find a way to connect with your friends, you may want to think about heading on a kayaking adventure. It can improve the health of your heart. There are countless benefits of kayaking, but one of the major advantages is that it can improve your cardiovascular health. If you want to find a way to boost your heart health, kayaking is a great sport to get your heart pumping and your blood circulating. In the end, the health of your heart could determine your overall health, which is something you should take very seriously.